A research team led by Keith Kaye, M.D., M.P.H., director of clinical research in the Michigan Medicine Division of Infectious Diseases, will put germ-zapping robots to the test at Detroit hospitals. The $2 million effort supported by the National Institutes of Health’s Agency for Healthcare Research and Quality is the first of its kind to study no-touch room disinfection. 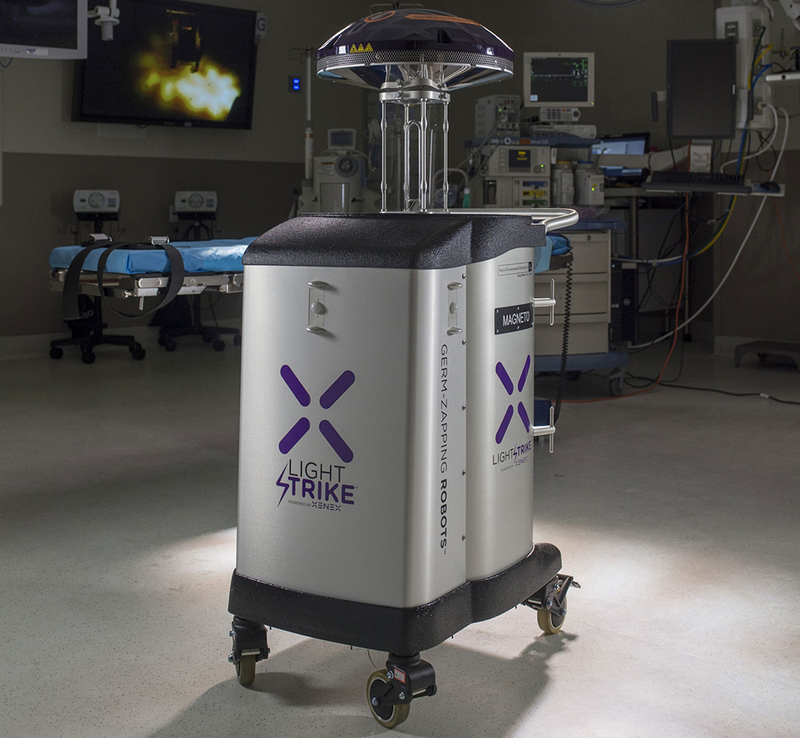 Michigan researchers will look at the ability of high-intensity ultraviolet light delivered by Xenex Germ-Zapping Robots to protect patients from deadly superbugs, such as Clostridium difficile, or C.diff, found on surfaces. Patients across the country are vulnerable to hospital-acquired infections — infections they can get while staying at a medical facility. Significant progress has been made in preventing some infection types, but they continue to be a major threat. Kaye will work with colleagues at Wayne State University and the Detroit Medical Center to conduct the study in two hospitals covering 16 total hospital units at the DMC. At the end of two years, researchers will report on rates of hospital-acquired infections in units where pulsed xenon UV light, or PX-UV, was added to cleaning routines compared to units where a sham UV disinfection system was added to standard cleaning. They’ll measure if cleaning plus PX-UV reduced the number of infections from drug-resistant organisms that cause C.diff; vancomycin-resistant enterococci; Klebsiella pneumonia; Escherichiae coli-producing extended-spectrum beta-lactamases; methicillin-resistant Staphylococcus aureus, or MRSA; and Acinetobacter baumannii. Hospital cleanliness is recognized as a critically important process to help prevent hospital-acquired infections. It involves extensive cleaning and disinfection after a patient has been discharged and before the next patient has been admitted to the room. The unique design of the study, which is double-blinded and sham-controlled, makes it the first to examine the clinical impact of adding PX-UV to hospital cleaning routines. Kaye is a professor of internal medicine at the University of Michigan. Before joining the faculty at Michigan Medicine, he was professor in the Division of Infectious Diseases and Department of Medicine at Wayne State University and DMC.